Stir 1 cup minus 2 tablespoons lukewarm (105 to 115°F) water and yeast in bowl of mixer and let stand for 5 minutes. If using quick or rapid rise yeast, skip this step and just mix the yeast with the flour. Add flour, 2 tablespoons olive oil, and 1 1/4 teaspoons table salt and beat until a dough forms. With a dough hook (or you can do it by hand) knead dough at high speed until soft, smooth, and sticky, 3 to 4 minutes. Continue kneading until dough is smooth and elastic. Transfer to a lightly oiled bowl and turn dough to coat with oil. Let rise, covered with plastic wrap, at warm room temperature, until doubled in bulk, 1 to 1 1/2 hours. Press dough evenly into a 9 inch square baking pan lined with non-stick foil or parchment. Let dough rise, covered completely with a kitchen towel, until doubled in bulk, about 1 hour. Stir together rosemary and remaining 1 1/2 tablespoons oil. Make shallow indentations all over dough with your fingertips, then brush with rosemary oil, letting it pool in indentations. 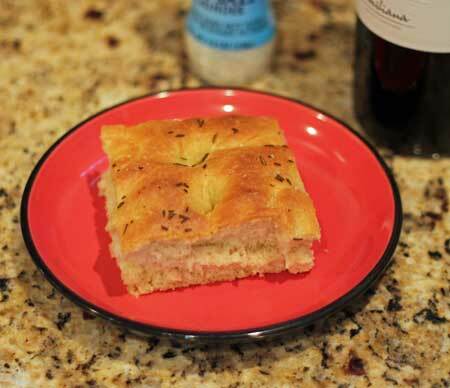 Sprinkle sea salt evenly over focaccia and bake in middle of oven until golden, 20 minutes. Rapid Rise aka instant yeast works just fine. To use instant yeast, just mix the yeast in the with the flour. Rising times will be around 30 to 45 minutes.